When Cairdean Vineyards opened in 2014, much of the initial press coverage focused on the food. A winery with a restaurant is a novelty in Napa County, which long ago restricted new wineries from operating them to preserve the county’s rural character. Edwin and Stacia Williams, the owners of Cairdean, didn’t exploit any zoning loopholes to manage this feat but rather pounced on the opportunity to buy a neglected commercial property that was adjacent to the 50-acre parcel they bought for the winery in 2010. The 7-acre property had once been the site of a small shopping center known as Vintners Village. Grander development schemes such as a hotel had all faltered because of limitations from the site’s zoning and septic system. A restaurant and retail operations were still allowable, so the Williamses set up shop for a restaurant, deli, boutique and tasting room. While the new restaurant and deli on Highway 29 have largely stolen the spotlight, the Williamses’ new winery is noteworthy in its own right. The new facility supports several custom-crush clients, is equipped with nothing but the best winemaking equipment and features nearly 18,000 square feet of caves dug into the base of Spring Mountain. Stacia (stay-sha) and Edwin both have backgrounds in science and engineering. Edwin Williams is a former engineer with jet engine producer Pratt & Whitney, worked at the Draper Laboratory at the Massachusetts Institute of Technology (MIT) and founded his own data filtering and navigation firm. While visiting the software company Object Design he met Stacia, who was working there as a software engineer. The couple had an interest in wine and winemaking, and after marrying in 2003 they moved to California so Stacia Williams could study winemaking at California State University, Fresno. The pair settled on the St. Helena property after Williams graduated, and the name of the winery means “friends” in Scottish Gaelic. While attending Fresno State, Stacia Williams met Cody Stacey, who also had an engineering background and for a time worked at the other leading jet engine producer, Williams International. Stacey and Stacia became friends while at Fresno, and the two stayed in touch after Stacey graduated and became an assistant winemaker at Bronco Wine Co. in Ceres, Calif. After nearly a year at Bronco, Stacey decided large-volume wine production wasn’t a good match for him and left for a harvest in New Zealand. When he returned to the United States, Stacia Williams, who oversees winemaking at Cairdean, hired Stacey as associate winemaker in charge of day-to-day operations. Stacey also helped in the design phase of the winery. The “semi-automated” winery employs a complex computer system to monitor and perform many winemaking tasks. Nearly 18,000 square feet of caves includes one of the largest caverns in Napa Valley. Equipment and design are used to minimize the use of water and energy required for wine production. “We had a goal for a semi-automated facility for cost savings but also for winemaking tools,” he told Wines & Vines while on a tour of the winery in November 2015. The crush pad is equipped to be run by one person. Almost all of the cellar operations can be monitored and managed remotely using the VinWizard computer system created by Santa Rosa, Calif.-based Wine Technology America. The cave includes an insulated room that can be warmed or chilled as needed, and its huge main chamber can accommodate hundreds of barrels. Stacey designed the winery lab with the help of laboratory consultants VWR International in Brisbane, Calif., and jokes that it makes the staff at ETS jealous. “The more information you have, you can empower yourself,” Stacey said. In addition to investing in the latest technology, the owners’ other guiding design principle was that the winery would be laid out for the most efficient use of labor and resources. Stacey said the typical crush pad setup for red wine grape varieties entails a forklift driver picking up a half-ton MacroBin and dumping it into a dosing hopper that steadily dispenses grapes onto a Milani sorting table that leads to a Scharfenberger incline belt conveyor. After dumping the bin, the forklift driver drops it in a bin washer from Tom Beard Co. that reuses the last rinse water from a wash cycle for the first rinse of the next bin. The inclined conveyor empties to a Bucher Vaslin Oscillys destemmer, and destemmed berries fall onto a Milani shaker table for further sorting before getting collected in bins and dumped into open-top tanks or sent to closed-top tanks via an Enoveneta Mohno must pump and 4-inch hose. White wine grapes either undergo cluster sorting and head to the press or get destemmed and sit in tanks for a while to encourage aroma development before pressing. The whites ferment in stainless steel tanks or barrels. Stacey has managed two harvests at Cairdean and said one person can handle a workflow of about 2.5 tons per hour. By the time the last of the fruit is hitting the final sorting table, the forklift driver has time to stack the clean bin and dump another loaded one to start the process once more. The cellar contains 36 stainless-steel tanks of varying sizes from Criveller as well as a bank of open-top tanks. All of the closed-top red fermentors feature fixed pumpover pipes and their own pumps, and they are linked to the VinWizard system. Each tank is also fitted with a temperature probe that runs its entire length or through the entire volume of must when the tank is filled. Snaking through the epoxy-coated walls and concrete floors of the winery are miles of conduit for Category 5 cable linking together the VinWizard system, which allows a winemaker to set a fermentation management protocol for each tank based on time, temperature and other parameters. “It will allow you to program an entire cycle from the very beginning,” Stacey said. The racking valves of each fermentor also feature screens to block out skins and seeds during pumpovers as well as a “no-flow” sensor that will trigger an alarm if juice isn’t flowing through the system. Stacey said the sensor is a backup to prevent a pump burning itself out running dry when a screen gets clogged. The system also features an air-injection system to add oxygen to the juice stream during a pumpover. After harvest, Stacey said he can use that feature to inject nitrogen for sparging tanks or gassing headspace. White fermentation tanks are each equipped with gas stones on the bottom for adding oxygen or sparging. Stacey said he’s also found that the temperature probes are a good way to manage partially filled tanks. VinWizard allows him to activate only certain parts of the probe for tank heating or cooling. If a tank is only partially filled, he can just activate the lower end of the probe to cool that section of the tank and not the entire volume. The VinWizard system operates with pneumatic valves connected to the winery’s compressed air supply. Such valves are more expensive but ensure the system will keep running even if the winery loses power. That means the winery’s custom-crush clients can monitor their wines as well. Clients can access VinWizard to control just the tanks holding their wines so they can set their own pumpover schedules, cool or heat tanks as needed and just keep an eye on their wine without getting in touch with someone at Cairdean. “Gone are the days when the winemaker has to drive up to the winery and read the sugar chart hanging on the tank,” Stacey said. The winery’s total capacity is far larger than Cairdean’s current production of between 5,000 to 6,000 cases, but that’s to accommodate custom crush and any future expansion. The Williamses own an 8-acre vineyard in the Coombsville AVA of Napa Valley, a 28-acre vineyard in the Russian River Valley of Sonoma County and an acre of vines just outside of the winery. Stacey said, “A lot of time and energy was spent on water savings” when planning the winery. To reduce the amount of water used during barrel washing, Stacey modified a Tom Beard Co. barrel washer to save the final rinse water from a washing cycle and use it for the first (and dirtiest) rinse of the next barrel. He also uses two Optima steamers as the final cleaning step, followed by sulfur dioxide gas. Napa, Calif.-based Pacific Coast Plumbing installed a water-heating system powered by a Pennant boiler that’s on a loop so hot water is constantly being circulated through the winery. “What that means is when you turn on a 25-foot hose, you’re only 25 feet from hot water (as opposed to all the way back to the boiler),” Stacey said. One small step that’s resulted in huge water savings is putting a small ball valve on the end of every hose. That means cellar workers can easily and quickly turn the water on and off as needed and not deal with pinching a hose or letting it run while they walk back to the hose station to turn off the water. One large membrane press, a Europress by Scharfenberger, handles all pressing at the winery. To make that quicker and more efficient, it’s connected with a fixed, 2-inch air hose to the winery’s Air Technology West compressor. Built by The Cave Co. of St. Helena, the winery cave provides space for barrel storage and other winemaking operations. The cave includes a chamber that can be heated or cooled depending on what’s needed. “This section of the cave is fully insulted; there’s 4 inches of polyiso insulation all the way around you, including the floor,” Stacey said. 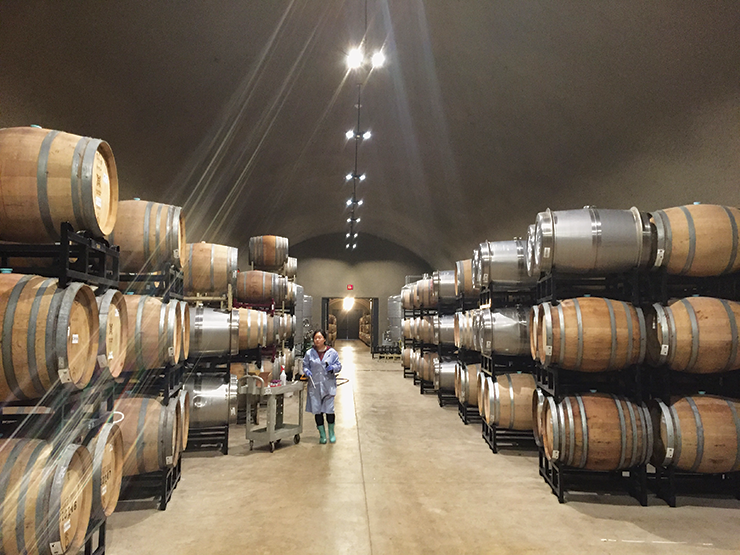 When Wines & Vines visited the winery, Stacey had a few barrels finishing malolactic fermentation. He said the room can be warmed to 73° F or cooled to 52° F. The room is ideal for controlling the temperature of the entire volume of the barrel to ensure a red wine finishes malolactic fermentation or a rosé in stainless steel barrels continues to ferment slow and cold. Just as in the cellar, there are water and gas stations spread liberally throughout the cave. As Stacey strolls between the barrels set on stainless steel racks, he mentions he worked with the architect plotting 50-foot circles on the plans to ensure a hose was always just a few steps away and that almost any type of job could be done in any corner of the production space. Several glycol hookups are also located throughout the cave for fermentations in T-bins with temperature-control plates. The steel racks along the cave walls support barrels stacked on blocks three high and are used primarily for Bordeaux varieties that rest for months without requiring much work aside from topping. Barrels holding Pinot Noir and Chardonnay, which typically require some stirring or racking soon after filling, are placed on standard, two-barrel racks in the main cave tunnel. Stretching more than 130 yards from end to end and measuring 32 feet wide and 25 feet tall, the main tunnel took a year to complete. “I’ve been told it’s the single-largest tunnel in Napa Valley,” Stacey said. The cave is large enough to accommodate barrels stacked six high at its highest point in the center with a five-high stack behind that and a four-high stack against the wall. After the 2015 Napa earthquake, Stacey said barrels will never be stacked that high—in fact, the winery plans to switch to earthquake-resistant racks soon. Four stainless-steel tanks near the main entrance of the cave are used mainly for racking and blending, but they are connected to the VinWizard system in case they’re needed for fermentation. Designed by Juancarlos Fernandez of Signum Architecture, the winery is similar to some of the firm’s other work, such as Odette Estate Winery on the other side of the valley in the Stags Leap District, in that it blends in with the oak trees and redwoods that cover the nearby hillside.